Microsoft made the biggest pitch to date for HoloLens as a business computing device on Monday during its Worldwide Partner Conference in Toronto, Canada. 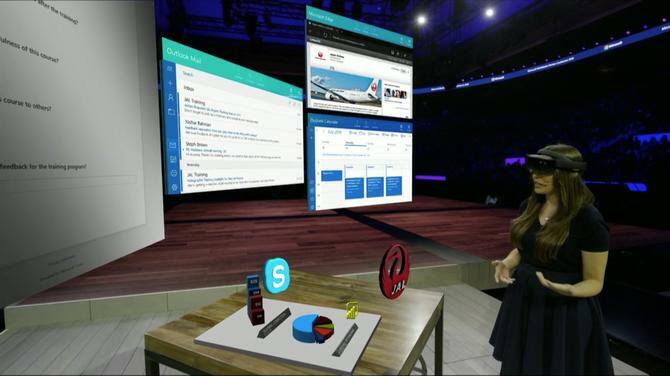 When Arantxa Lasa Cid, a program director at the company, took the stage for a HoloLens demo, she pulled up a workspace that looked a lot like a massive, multimonitor desktop setup, complete with virtual monitors showing an Outlook calendar, email and two web browsers. It looked a lot like a traditional desktop setup, with one catch: Cid was standing in front of an empty table, wearing one of Microsoft's augmented reality headsets. And then, with the tap of her finger, she pulled up a model of a jet engine. 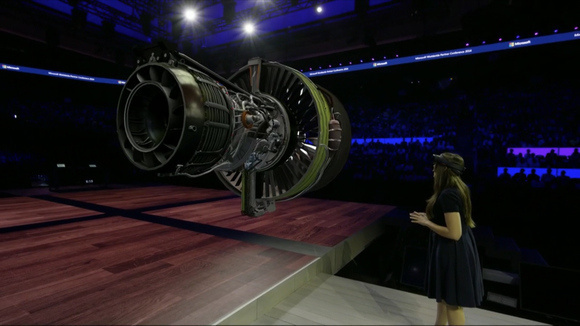 Microsoft's Hololens used for jet engine training is demonstrated at the company's Worldwide Partner Conference in Toronto on July 11, 2016. A friendly British voice explained the various components of the engine, first at a small scale, and then at full size, allowing Cid to explore the engine and how it operates -- all on stage inside the Air Canada Center. It's part of a partnership between Microsoft and Japan Airlines to use the augmented reality headgear as a training device. The goal is to make it possible for people to complete training courses without having to leave their normal workspace. Despite first showing it off with whiz-bang demonstrations of consumer 3D modeling and Minecraft, Microsoft has been pitching the HoloLens as a business computing device. Monday's presentation was the most concrete realization of that vision, with clear examples of how the device could be used in an everyday business context as well as on special occasions. There was a clear message in that for attendees: HoloLens is open for business. Microsoft General Manager Lorraine Bardeen encouraged interested companies to reach out to a sales representative for access to the devices, which are currently shipping. Right now, HoloLens is available as a developer edition, which requires users to fill out a survey in order to get access to the devices. It's still an open question how business users will get the most mileage out of a HoloLens outside one of Microsoft's staged demos. By reaching out to the partners in the audience in Toronto, Microsoft has taken another step toward driving business adoption.